This morning in Huntington at 8:00AM it’s currently 54 degrees under overcasts skies. Winds are out of the south at 0-4 mph. Relative humidity is 93%, dewpoint 52, barometric pressure 29.39″ and falling. We picked up 0.61″ of rain in the past 24hrs. 24hr high was a balmy 67, low 46. We’ll continue to experience the remnant of Sandy for the next several days as temperatures gradually return to seasonable norms. Today well see cloudy skies with showers likely, mainly this morning. Highs will be in the lower 60s with light and variable winds. Chance of rain is 70%. Tonight should be cloudy with a chance of showers, mainly until midnight. Lows will be around 40 with light and variable winds. Chance of rain is 30%. Thursday should be cloudy with a 40% chance of showers. Highs will be in the lower 50s with light and variable winds. Thursday night should be cloudy with a 40% chance of rain showers. Lows will be in the upper 30s with light and variable winds. Friday’s looking cloudy with a 50% chance of rain showers. Highs will be in the upper 40s with light and variable winds. Friday night should be cloudy with a 50% chance of rain showers and lows in the lower 30s. Last year on this date we had a high of 51 and a low of 28. Burlington norms for this date are highs of 52°F and lows of 35°F. Record high was 69°F in 1946. Record low was 17°F in 1925. Tomorrow will be 2m 42s shorter. The Moon is waning gibbous, 16 days old with 97% illumination. Deer and weasel (?) 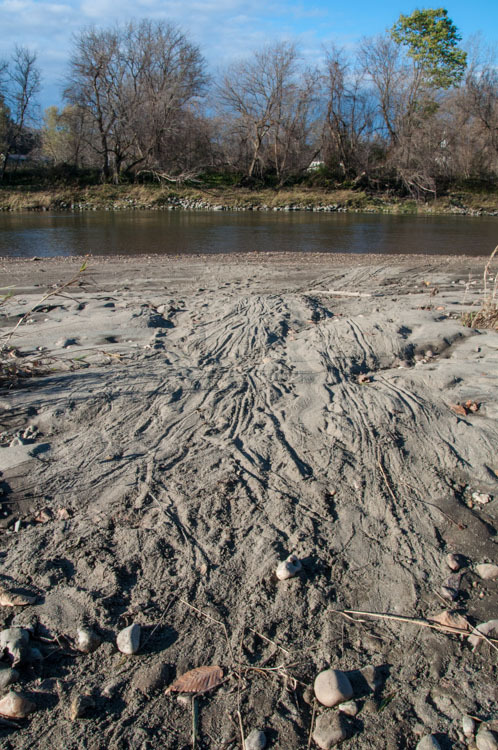 tracks in the silt along the Winooski River. This morning in Huntington at 6:30AM it’s currently a balmy, blustery and rainy 58 degrees under partly cloudy skies. The full moon, Jupiter and Venus are ducking in and out of the fast moving clouds. Winds are out of the east at 10-15 mph. Relative humidity is 83%, dewpoint 53, barometric pressure 29.40″ and rising rapidly. We picked up 0.77″ of rain overnight. Our highest wind was 22 mph. 24hr high was 62, low 58. There is a Wind Advisory in effect for our region until 5:ooPM this evening. Sandy is now a “post-tropical cyclone” with its center is currently moving slowly through central Pennsylvania. We’ll continue to feel its effects into the weekend as its remnants head into southern Québec by Thursday. Today we’ll see mostly cloudy skies with scattered showers. It will be blustery with highs in the mid 60s and southeast winds 15 to 25 mph gusting up to 50 mph. Chance of rain is 50%. Tonight should be cloudy with numerous showers, mainly after midnight. Lows will be in the mid 50s with east winds 15 to 20 mph gusting to 40 mph early. Chance of rain is 60%. Wednesday showers are likely. Highs will be in the upper 50s with south winds around 10 mph. Chance of rain is 70%. Wednesday night showers are likely. Lows will be in the lower 40s with south winds around 10 mph. Chance of rain is 60%. Thursday showers are likely. Highs will be in the lower 50s with south winds around 10 mph. Chance of rain is 60%. Thursday night should be cloudy with a 50% chance of rain showers. Lows will be around 40. Last year on this date we had a high of 45 and a low of 28. We picked up 0.75″ of snow–the first of the season. Record high was 70°F in 1935. Record low was 20°F in 1925. Tomorrow will be 2m 44s shorter. The Moon is waning gibbous, 14d 22h old with 100% illumination. We lost power for about 3 hours last evening from 4:30 to around 7:30. Pretty impressed that Vermont Electric was able to get it going again so soon. All in all, the impacts of Sandy here have been pretty modest. We’ll see how the neighborhood faired when daylight dawns. How did you do? This morning in Huntington at 6:30AM it’s currently 52 degrees under mostly cloudy skies. I can see Venus peeking out from behind the clouds. Winds are light out of the south here. Relative humidity is 86%, dewpoint 48, barometric pressure 29.75″ and falling. 24hr high was 62, low 45. There is currently a high wind warning in effect for our region from 2:00PM today to 11:00AM Tuesday. Sandy is currently a category 1 hurricane off the coast of Virginia. She’s expected to make a left hook and come ashore late this afternoon in New Jersey. We, however, will start to feel the affects of this “Frankenstorm” starting this afternoon. We’ll see mostly cloudy skies with a slight chance of light rain this morning, then a chance of rain this afternoon. Highs in the upper 50s with northeast winds 10 to 15 mph and gusting up to 25 mph this morning, increasing to 20 to 30 mph with gusts up to 50 mph this afternoon. Chance of rain is 50%. Tonight rain is likely. Lows will be in the mid 50s with east winds 35 to 45 mph and gusting up to 70 mph. Chance of rain is 70%. Forecasts are calling for the most damaging winds to occur overnight with indications that wind speeds might reach as high as 90 mph on Mount Mansfield! Yikes! Once again, widespread power outages are expected so be prepared. Rain totals for our region are on the order of about 1″ with local heavy rainfall delivering more. Tuesday should bring us some partly sunny skies with a chance of rain in the morning, then a chance of showers in the afternoon. Highs will be in the lower 60s, and it’ll be windy with southeast winds 20 to 30 mph gusting up to 50 mph. Chance of rain is 50%. Tuesday night should be partly cloudy with a 50% chance of showers. Lows will be in the lower 50s with southeast winds 20 to 25 mph and gusting up to 45 mph. Wednesday showers are likely. Highs will be in the upper 50s with south winds around 10 mph. Chance of rain is 60%. Wednesday night should be cloudy with a 40% chance of showers. Lows will be in the mid 40s. Last year on this date we had a high of 40 and a low of 25. Record high was 71°F in 1946. Record low was 20°F in 1969. The Moon is the full Hunter’s Moon (Northeast Native American, Colonial American), 13d 23h old with 100% illumination. Other names for this month’s full moon include: “Harvest” (English & Celtic), and “Blood” (Medieval and Neo Pagan Wiccan). 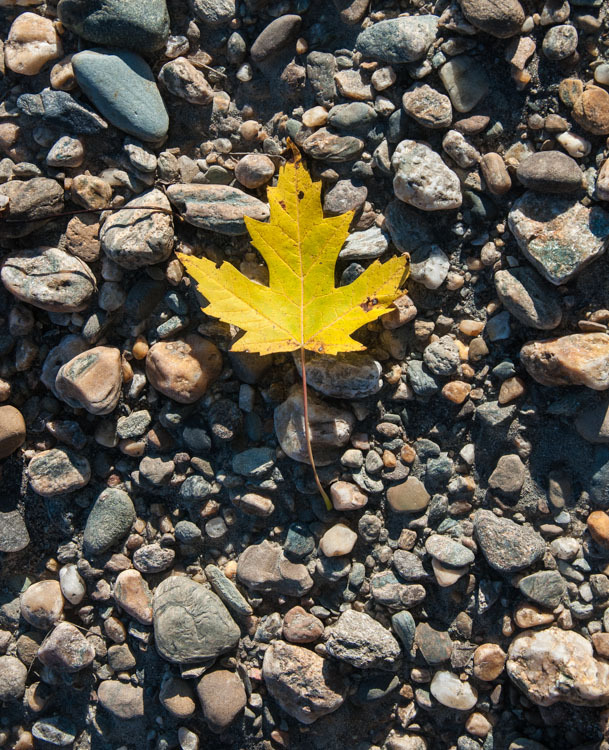 A solitary maple leaf on the bank of the Winooski River. This morning in Huntington at 8:45AM it’s currently 49 degrees under overcast skies. Winds are calm. Relative humidity is 97%, dewpoint 48, barometric pressure 30.00″ and rising. 24hr high was 69, low 47. We’ll see one more day of calm weather before Hurricane Sandy makes herself felt. We’ll have cloudy skies today with highs around 60 and light and variable winds. Tonight should be cloudy with a slight chance of showers after midnight. Lows will be in the mid 40s with light and variable winds, becoming northerly around 10 mph after midnight. Chance of rain is 20%. Monday should start off cloudy with a chance of showers in the morning, then a chance of rain in the afternoon as Sandy approaches the coast of New Jersey. The winds will start to pick up Monday midday. Highs will be in the lower 60s with north winds 10 to 15 mph and gusting up to 30 mph, then shifting to northeast and increasing to 20 to 30 mph with gusts up to 55 mph in the afternoon. Chance of rain is 50%. Monday night rain is likely. Lows will be in the mid 50s. Winds will increase from the east at 35 to 45 mph with gusts up to 75 mph overnight as Sandy makes landfall somewhere in New Jersey around midnight and heads on its unprecedented hooking northwestward course. Chance of rain is 70%. With deep low pressure at its core (currently measured at 28.02″) Sandy’s main threat to us will be its winds, especially in upslope areas like our Western Slopes. High wind warnings have already been posted for our region, and widespread power outages are likely. 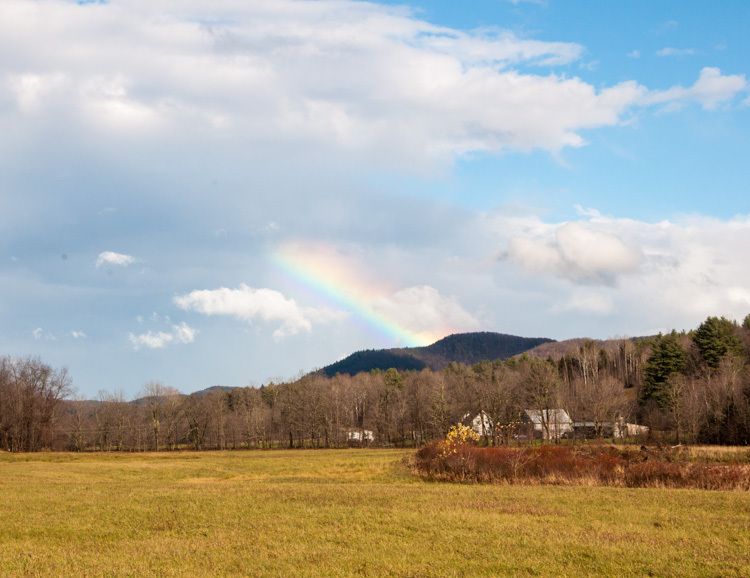 Batten down the hatches folks… Rainfall amounts are expected to be relatively light for a tropical system, but we could see amounts to 2″-3″ especially in southern Vermont. We should be thoroughly under the gun Tuesday with southeast winds 25 to 35 mph and gusting up to 65 mph during the day. Rain and wind will continue through the day and into the night. Sandy will be over Pennsylvania by Tuesday night, and we’ll see continued showers and decreasing winds through the rest of the week as the storm loses strength and heads northeasterly across the north country and out to sea. It should be an interesting week, and certainly one for the meteorological history books! Here’s a link to Sandy’s path, and here’s the current discussion from the National Hurricane Center. Also, check out the Eye On The Sky Facebook page as they’re keeping on top of the situation. Last year on this date we had a high of 46 and a low of 24. Record high was 75°F in 1947. Record low was 19°F in 1974. The Moon is waxing gibbous, 13d 1h old with 98%, illumination. So folks, some tempestuous (and exciting I’ll admit!) weather ahead! I’m fully anticipating being without power for perhaps an extended period from Monday night through Tuesday. So, make plans now and be prepared! 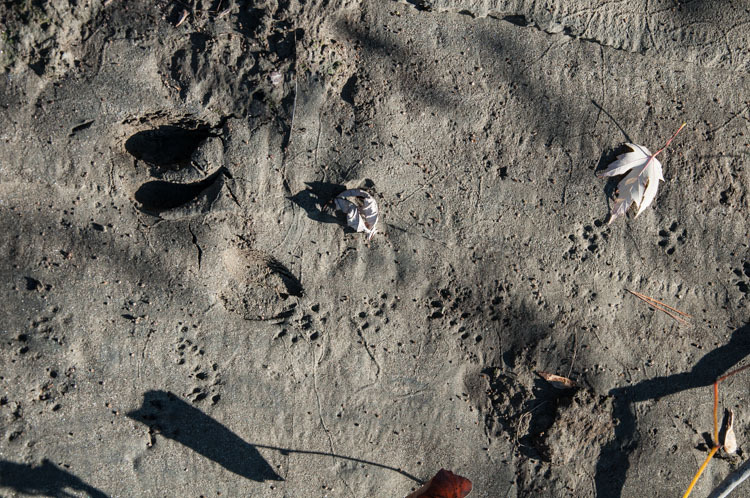 Marks in the silt and sand along the Winooski River in Richmond where beavers have dragged willow branches into the river. This morning in Huntington at 8:15AM it’s currently 44 degrees under partly cloudy skies. Wind are calm. Relative humidity is 98%, dewpoint 44, barometric pressure 30.06″. 24hr was a balmy 64, low 44. We’ll start off the day with partly sunny skies. Highs will be in the mid 60s with light and variable winds. Tonight should be partly cloudy until midnight, then cloudy as a cold front approaches and stalls to our west. Lows will be in the mid 40s with light and variable winds. Sunday should be cloudy with highs around 60 and light and variable winds. Sunday night should be cloudy with lows in the upper 40s and north winds around 10 mph. Last year on this date we had a high of 40 and low of 34. We picked up 0.02″ of rain. Burlington norms for this date are highs of 53°F and lows of 36°F. Record high was 74°F in 1947. Record low was 22°F in 1974. The Moon is waxing gibbous, 12 hours old with 95% illumination. Hurricane Sandy is a very interesting storm–and a very unusual one for this time of year. I encourage interested readers to learn a bit more about it. Here’s a good place to start. 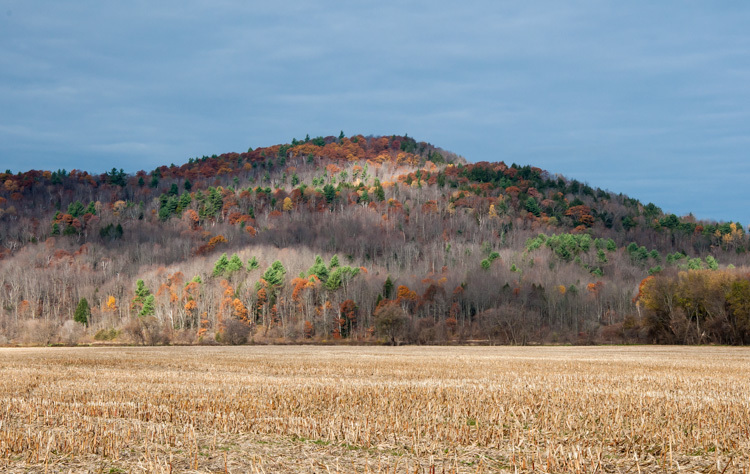 White pines, coppery oaks, and a few yellow aspens lend lingering color to the hillside beyond the Farr Farm cornfield in Richmond yesterday morning. This morning in Huntington at 6:25AM it’s currently 42 degrees under clear skies. Venus is hanging low over the Greens. Winds are calm. Relative humidity is 98%, dewpoint 42, barometric pressure 30.16″. 24hr high was 65, low 42. High pressure will deliver another dry and partly sunny day. It will be warmer with highs in the lower 70s and light and variable winds, becoming southerly around 10 mph this afternoon. Tonight should be mostly clear until midnight, then become partly cloudy. Lows will be in the lower 50s with south winds around 10 mph until midnight, becoming light and variable. Saturday should be mostly cloudy with a chance of showers in the afternoon as a cold front approaches from the west. Highs will be in the mid 60s with light and variable winds. Chance of rain is 30%. Saturday night should be cloudy with a 30% chance of showers. Lows will be around 50 with light and variable winds. Sunday’s looking cloudy with a 40% chance of rain. Highs will be in the upper 50s with light and variable winds. Sunday night should be mostly cloudy with a 40% chance of rain and lows in the mid 40s. Last year on this date we had a high of 50 and a low of 31. We picked up 0.10″ of rain. Record high was 75°F in 1963. 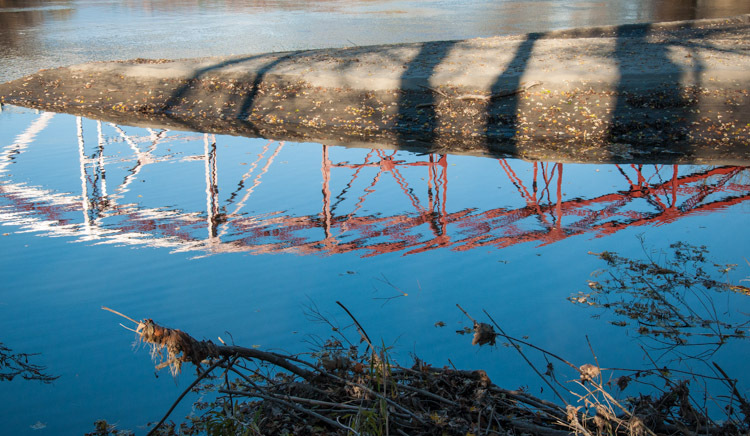 Record low was 19°F in 1941. The Moon is waxing gibbous, 10d 22h old with 89% illumination. 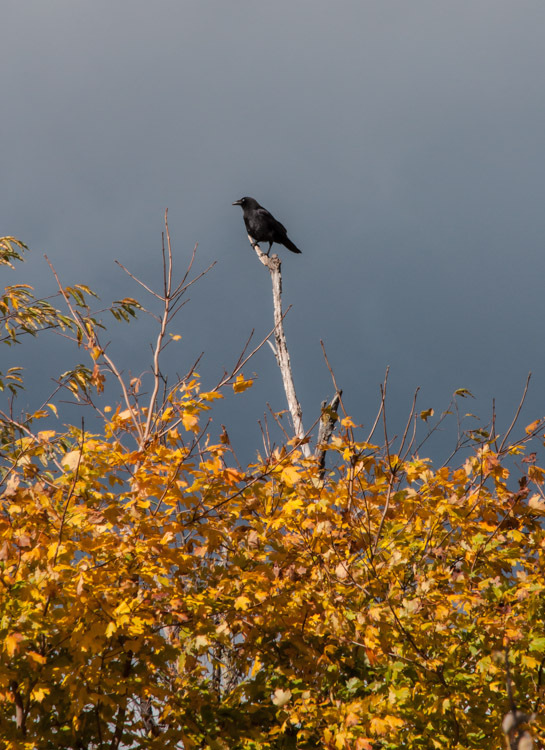 Grey clouds, bright leaves and black crow near Boyer’s Orchard in Monkton. This morning in Huntington at 7:45AM it’s currently 35 degrees under mostly clear skies. Winds are calm. Relative humidity is 97%, dewpoint 34, barometric pressure 30.22″. 24hr high was 62, low 35. High pressure continues to influence our weather. We’ll see partly sunny skies today with highs around 60 and south winds around 10 mph. Tonight should be mostly cloudy until midnight, then become partly cloudy. Lows will be in the upper 40s with south winds around 10 mph until midnight, becoming light and variable. Friday should be partly sunny and warmer with highs in the lower 70s and south winds around 10 mph. Friday night should be partly cloudy with lows in the lower 50s and light and variable winds. A cold front should move through the region Saturday bringing cloudy skies and a 40% chance of showers. Highs will be in the lower 60s with light and variable winds. Saturday night should be cloudy with a 40% chance of showers. Lows will be in the upper 40s. Last year on this date we had a high of 49 and a low of 32. We picked up 0.43″ of rain. Burlington norms for this date are highs of 54°F and lows of 36°F. Record high was 80°F in 1963. Record low was 22°F in 1949. The Moon is waxing gibbous, 9d 23h old with 83% illumination.